Classical music is sometimes thought of as high art, performed in beautiful music centers to serious and wealthy crowds, wearing fine clothes. But two young musicians are working hard to make this kind of music more available to new audiences. Nick Luby and Susan Zhang do this with the help of the Concert Truck, a vehicle that carries almost everything needed for a musical performance. Practicing piano is something Zhang does everyday. "Ideally, I'd like to get about four hours of practicing each day." Luby does the same, especially on the days when the two musicians are to perform. After getting their piano ready, Zhang and Luby get into the Concert Truck. The two drive the truck to a farmers market in the city of Baltimore Maryland.The 5-meter long vehicle has audio equipment and lights. It takes a few minutes to change the truck into a stage. Then Luby and Zhang begin to perform. Luby says people can listen to music almost anywhere because of wireless electronics and devices that connect directly to the ears. But that experience is very different from attending a performance, he says. “There is something about live music that is essentially human and connecting. When you listen to live music, there is energy that you just can't get from a recording. It brings people together. For me, it makes life worth living." Zhang says the concert truck idea was Luby’s. “When he came to me with this idea, I thought he was a little crazy, but then I watched this movie, Chef. It's about a chef who has a food truck and he travels across the country and I thought that that kind of life would be so cool, so I decided to go in on this with him." Performing on a truck in a city with the noise of traffic and crowds is very different from playing in a concert hall. "Usually when we perform in a concert hall, everything is very controlled, everybody is very quiet, and the lighting has to be just right. But, in a place like this, anything could really happen." The artists say they do not take it as an insult when people do not stop to listen. "When people walk by and listen for a second and keep going, you definitely notice, but the fact that someone will stop even for a minute is a nice thing to be able to share that moment with people." Reba Cornman was shopping at the farmers' market when she shared one of those moments with the two performers. "…all of a sudden I heard Prokofiev's Cinderella being performed on piano. It was extraordinary. I know they're trying to reach out to all kinds of audiences and being on a truck is such a remarkable way to do that." 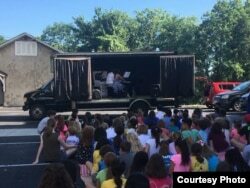 The Concert Truck has brought music to schools, children's homes and homeless shelters. And it has traveled to many places in the United States. "The dream is to create a platform that allows musicians, not just us, but many musicians, to share their craft and their art broadly." That dream is what keeps Luby and Zhang energized and on the road, bringing the Concert Truck and classical music to new audiences. Faiza Elmasry reported this story for VOA News. Caty Weaver it for Learning English. Mario Ritter was the editor.